I promised myself by the end of autumn, I’d improve my trees! Let’s see if it happens. 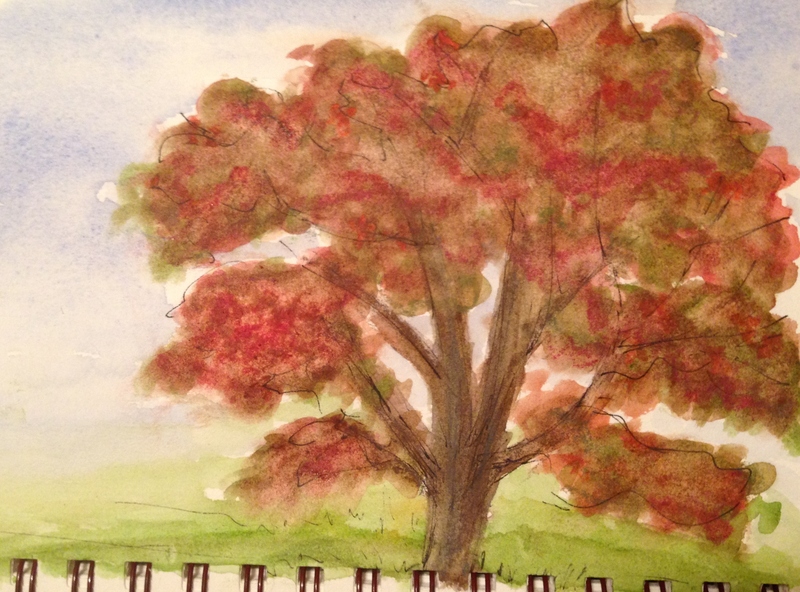 Sketched our little dogwood tree in pen and then went back with the Cotman travel watercolor palette, then added a bit of watercolor pencil and Neocolor II water soluble pastels for a bit more definition in my Strathmore mixed media journal. (Love that thing!). Lots of improvement to make, for sure, but trees are a worthwhile subject. 🙂 Happy Wednesday to all my talented blogging friends. Peace and all the colors of autumn (and spring) to you and yours today. This is really good Laura. I think you are using a difficult medium for trees. Stippling would be easier in acrylics or oils but you manage it with those red leaves. It’s pretty! Thanks Catherine! I went over the WC paint with a bit of WC pencil, which helped a lot! I really like the complex of colors you’ve accomplished. I would e very proud of that tree. Boy and keep on and keep on! Thx Sharon! Nice and lush and good depth created with your colorization in the leaves. I’d add a few more dark touches to the bark, if I wanted to improve this even more. Very nice, Laura! Thanks! Boy I’ve given up on this one. I’m hoping when I get “good” at trees, this’ll be a nice “before” picture lol. Whenever that happens. Thanks for the tip! Lovely colors on your little dogwood! I think that’s a good approach: to sketch with ink and then watercolor it, adding more details with the WS pencil and pastels for details. BTW, I bought a set of Inktense, but haven’t used it yet. Can’t wait to try! Awwww thanks Charlie. Reaching for the sky! Thank you, Jill, and have fun painting! Any feathers in your paintings today? Beautiful tree! They are such a great subject to paint and you are doing wonderfully with them. Thank you, Haunani! I have a long way to go, but at least I’m making the journey!